This section is dedicated to the various morphs that can or have been found in the wild. 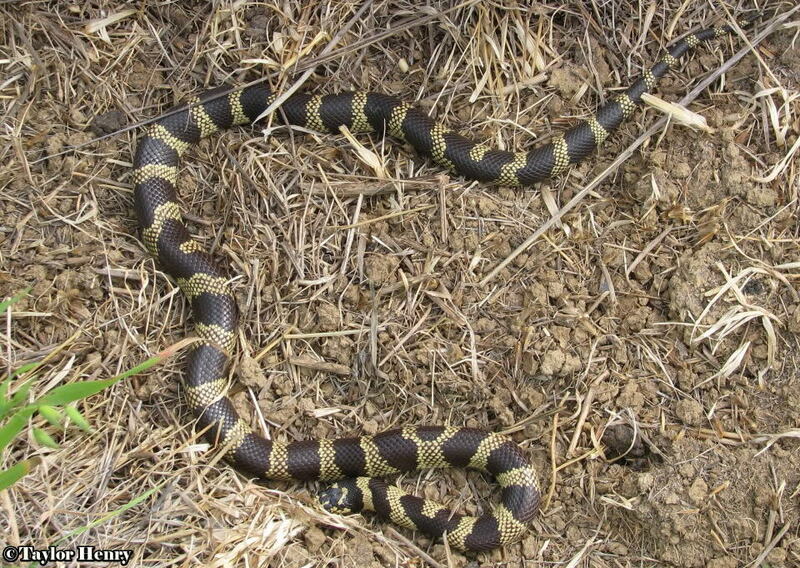 This is a banded morph found in the Central Valley of Northern California. Speckles of light pigment are found in the dark bands mostly from the lower to upper sides. These speckles are basically a dot on each scale that are often elongated and not perfectly round. The percentage of spots vary from one individual to the next. This is more likely a trait that runs in certain blood lines and not predictable. This is not a morph, but more of a random act by chance. 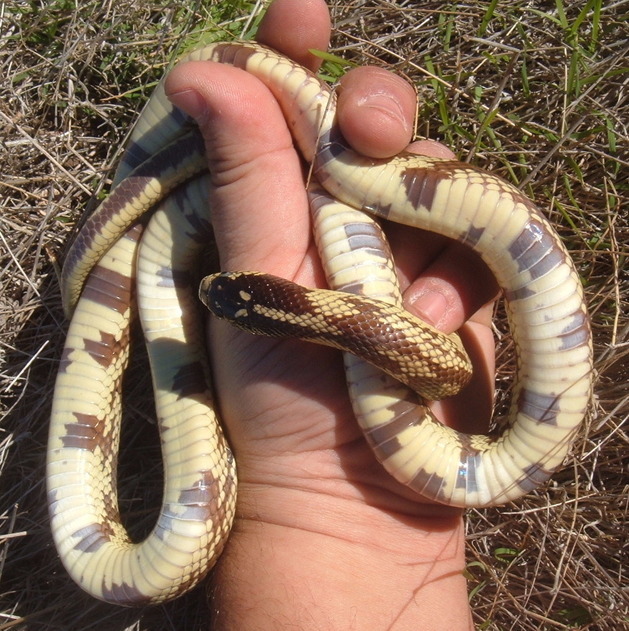 Many banded specimens will have at least a few light colored bands that are off set and don’t meet at the top. They reach the top but are completely separated from each other and appear as half bands. A zippered Cal king will have many of these half bands, creating a zipper look to the pattern. The more of a zipper pattern, the rarer it is. I’ve never heard of a completely broken banded king creating a complete zipper look. An extremely high band count found in Los Angeles County. 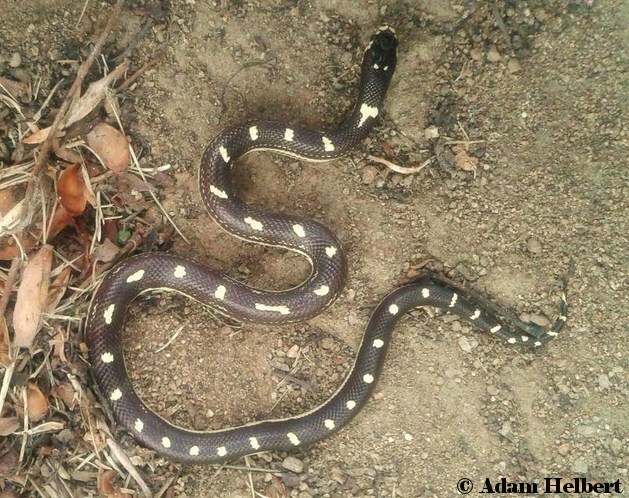 This is a banded morph found in San Diego County. 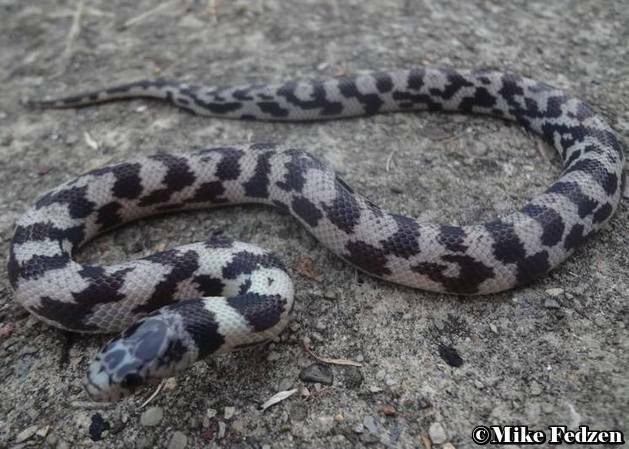 These individuals will have patches of dark pigment within the light bands. These patches can be all sorts of shapes. 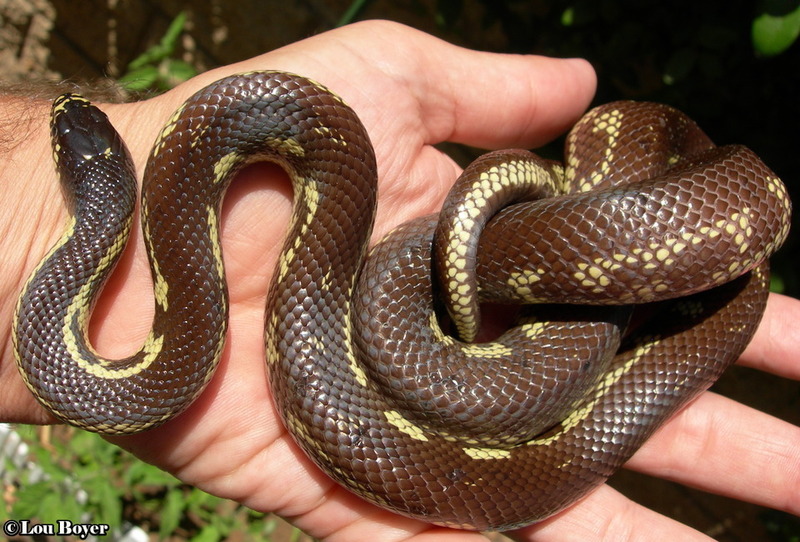 Often the scales in the light bands will be tipped with brown. this is generally a costal phase morph. In captivity, there are black and white kings with this look. More than likely this is the result of wedge band genes at work that originated somewhere down the line. 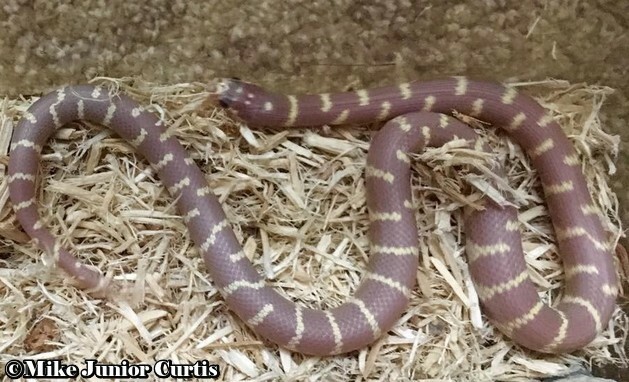 The genetics for this morph are unknown. More than likely its a trait that runs in the blood line. 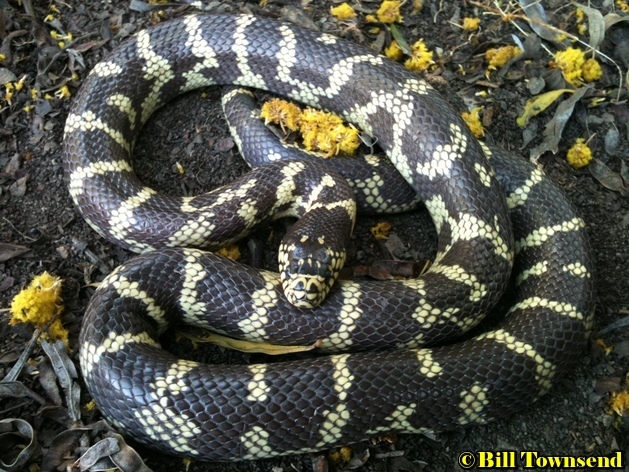 This is probably San Diego's version of the hypermelanistic morph. 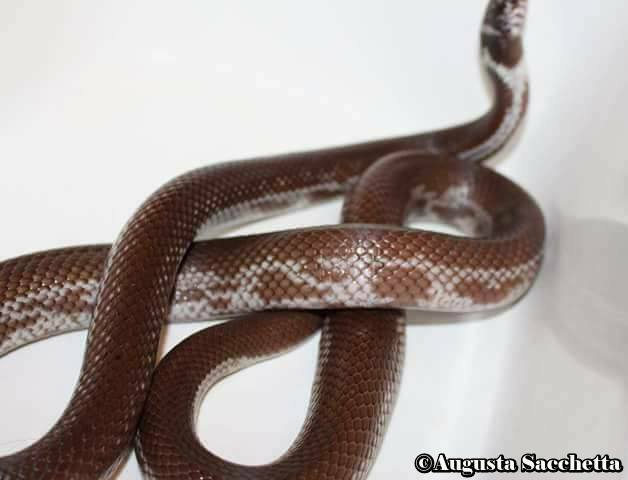 Although they don't have the dark head pattern, they do have a substantial increase of dark pigment in the light areas creating a webbed look. 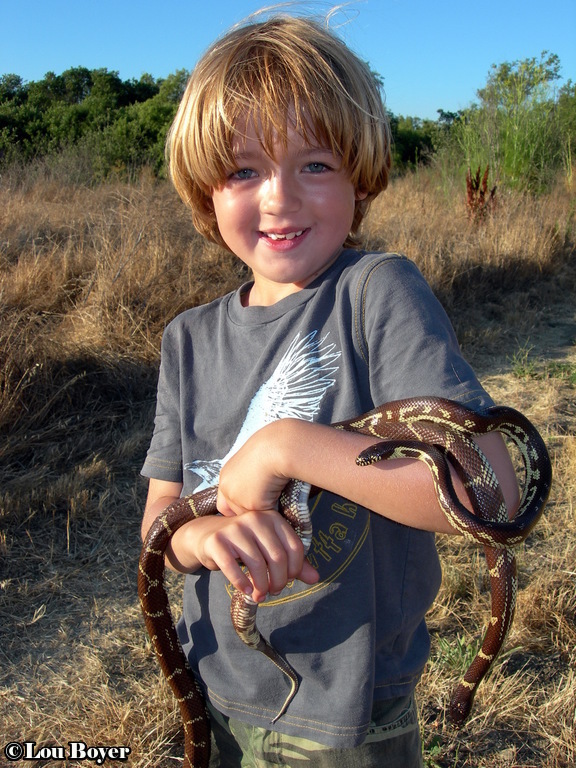 This morph may only be found in Carlsbad. 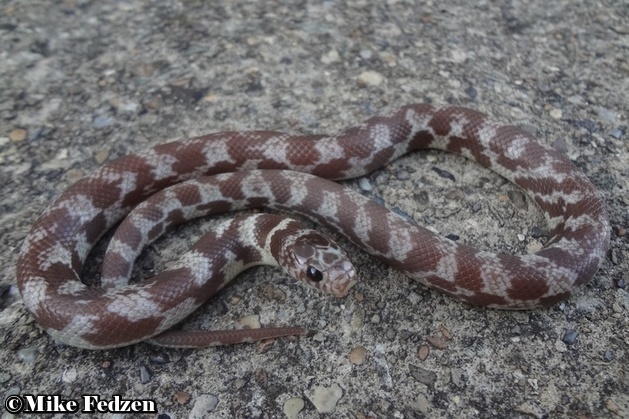 This morph is very interesting because it comes from a locale dominated by coastal phase types (yellow & brown), yet it never displays the yellow coloration. Its color is always white where the yellow would be. Another very interesting feature is it has a Newport tail, which is basically solid brown above with no pattern at all. It comes from an area where striped kings occur, not Newports. Striped kings and striped aberrant kings always show pattern on top of the tail. 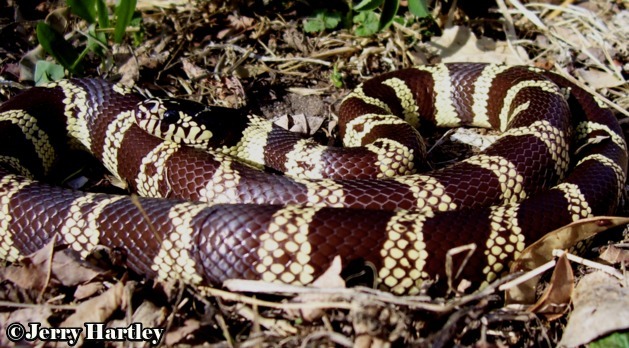 The overall pattern itself is unlike any striped aberrant king, but it does show similarities to certain types of aberrant patterned Newports, like the Reverse wide striped Newport and the Scrambled banded Newport. 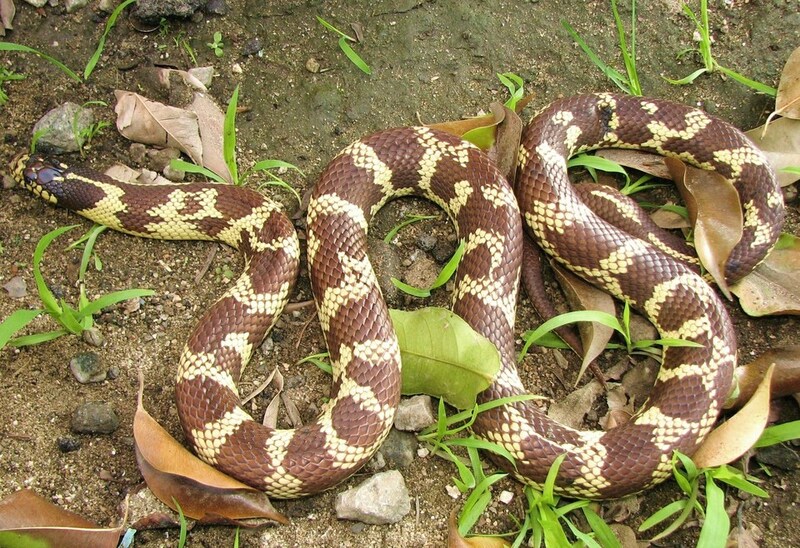 The typical pattern of the Palomar ghost consists of a series of blotches down the back that may be connected or unconnected. 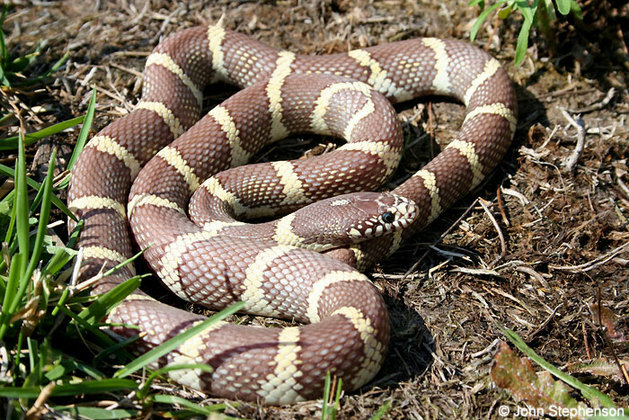 In some individuals the blotches are so well connected the pattern closely resembles a reverse wide striped Newport. 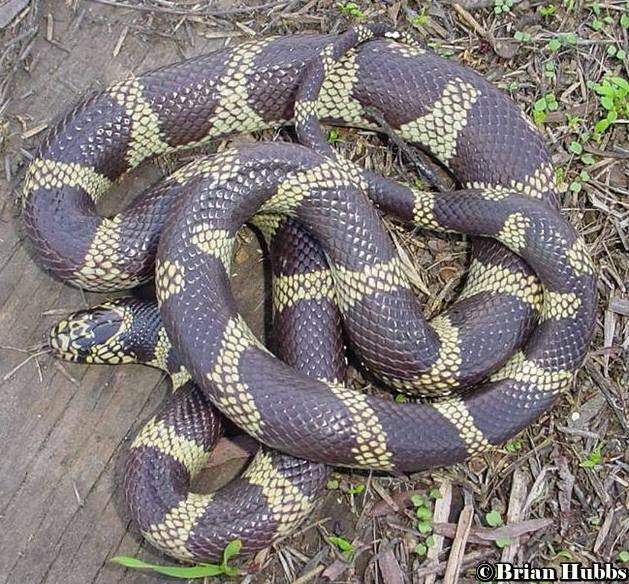 Some individuals show a faint stripe down the back in the form of speckling. 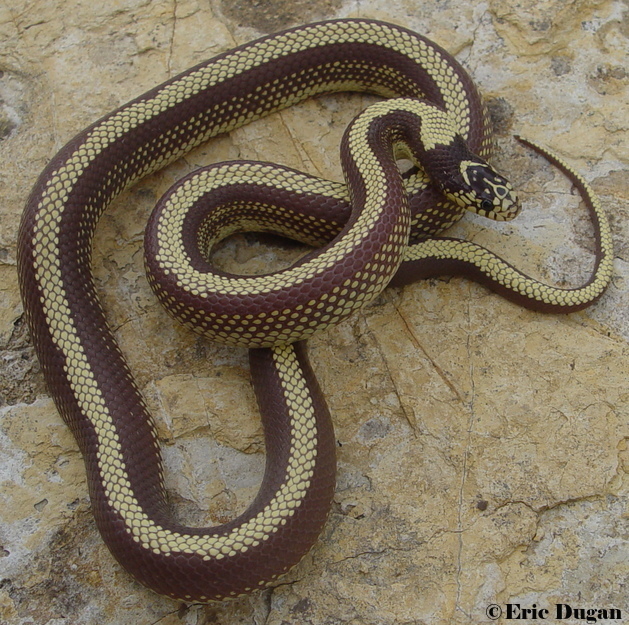 The stripe is never well defined like in the San Diego striped morph. Often the scales on the outer areas of the blotches will have a white center, which gives a look of blotches fading into the white areas. The sides are very similar to that of a Newport by having small random dark aberrancies scattered throughout the white. Most individuals are light brown, but there are some dark brown individuals as well. Like the San Diego striped king and the Newport, the belly is sometimes solid brown. 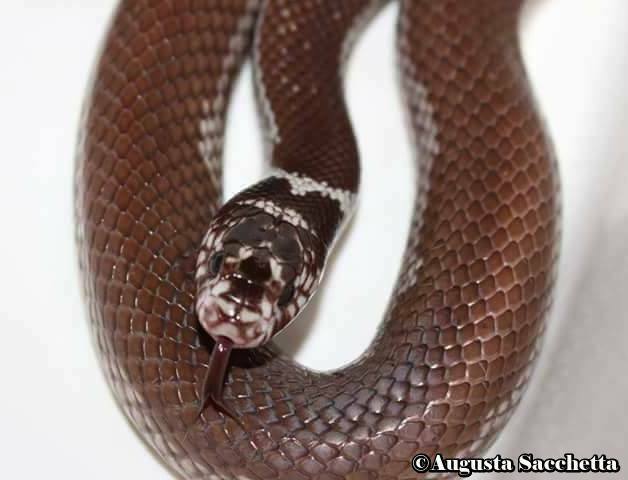 The eyes are reported to be dark red, although this doesn’t always show up in photos. 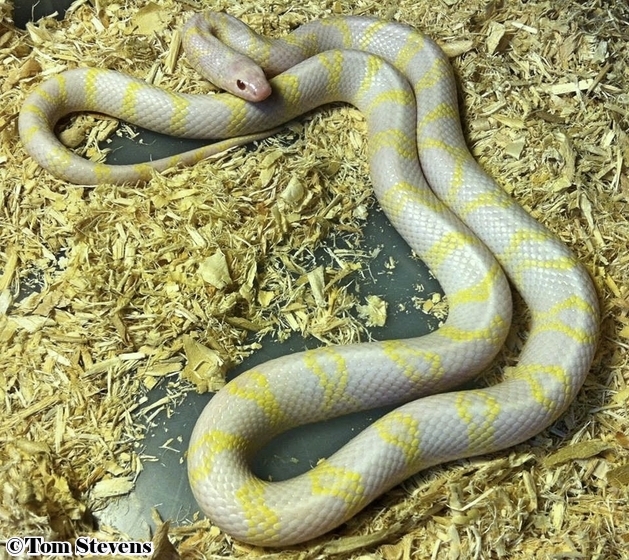 The genetics of this morph work like any other single recessive gene, but it may be more than just a single recessive. Since the normal yellow is always replaced by white, and the pattern differs greatly from any striped aberrant king, there's a good possibility two genes are at work here that effect the color and pattern individually. These genes may be located very close together on the same chromosome. Because of their close proximity with one another, they are inherited together. 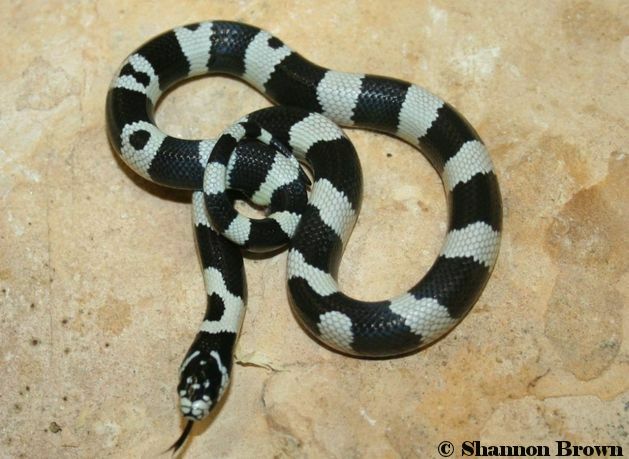 The gene that is responsible for the white coloration could possibly be an axanthic gene. The history of this morph starts way back in the late 70's when Randy Limburg collected an unusual striped king from the Palomar Airport Rd. area in Carlsbad CA. It had a very wide stripe and was very faded in color compared to other kings in the area. It was very likely a Mocha morph. Gary Keasler liked that king a lot and was able to acquire it from Randy. Around 1983 Gary and Randy went to the Palomar site in Carlsbad and collected several kings that day. 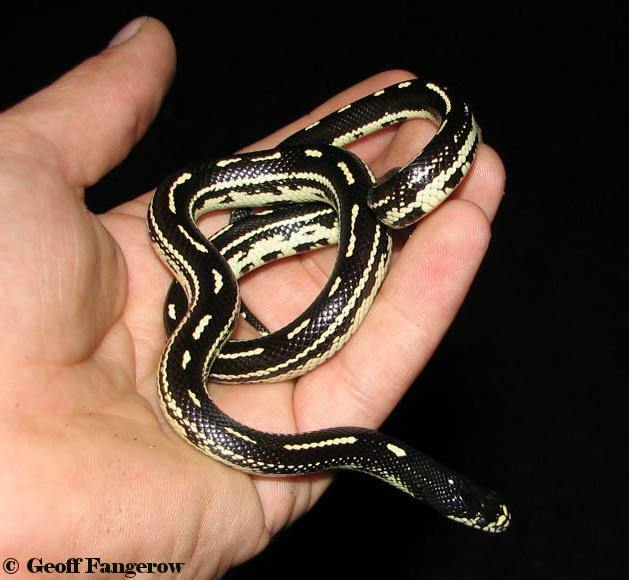 Gary kept a female striped king and bred it to the faded wide striped male. That clutch ended up hatching out striped and banded kings. One of the kings was wide banded and lighter brown than the rest. Randy kept it, raised it up and bred it to its father the faded wide striped king. Randy's goal was to produce more faded kings, but to his surprise he hatched out two Palomar ghosts in 1989. 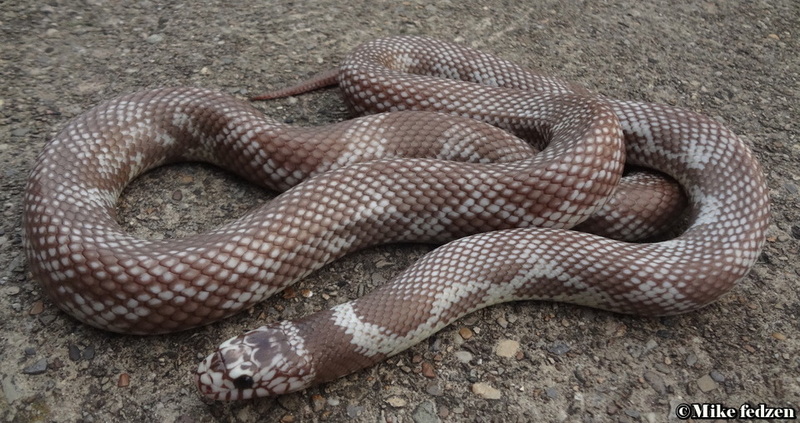 In recent years, Kerby Ross has bred the Palomar Ghost to other recessive morphs and interestingly enough, some double hets from those clutches appear hypo like with dark red eyes. One thing to note is several breeders have reported fertility issues when breeding ghost to ghost. 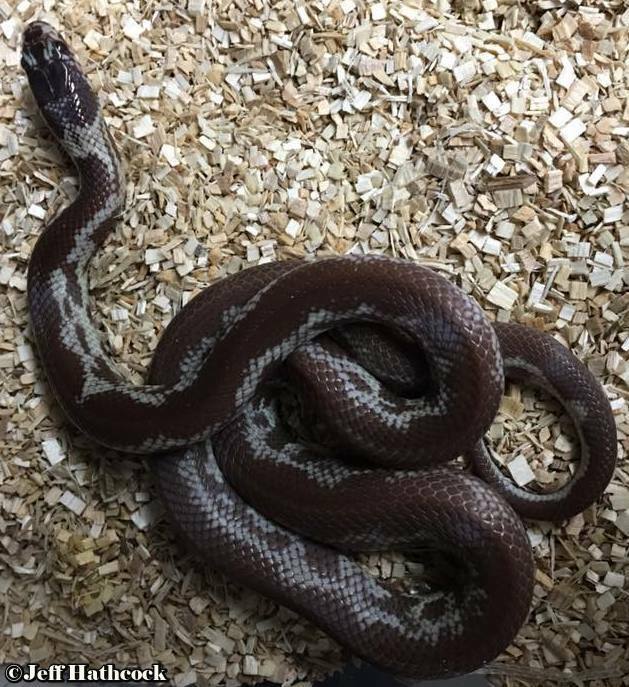 Kerby says he’s had better results producing this morph by breeding 2 het ghosts together. These reverse wide striped types seem to rarely pop out randomly. 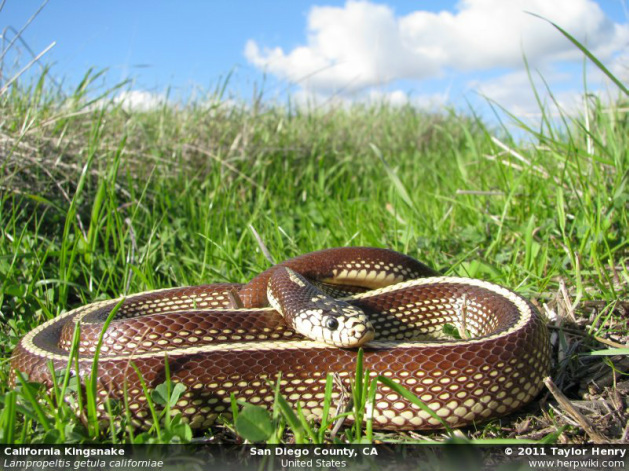 The San Diego striped morph is a natural occurring morph that ranges from Western Riverside County in the east, to southern coastal Orange County in the west, then down through most of San Diego County to the edge of the desert and down into North Western Baja California. Its range overlaps with the Newport morph in Southern coastal Orange County. 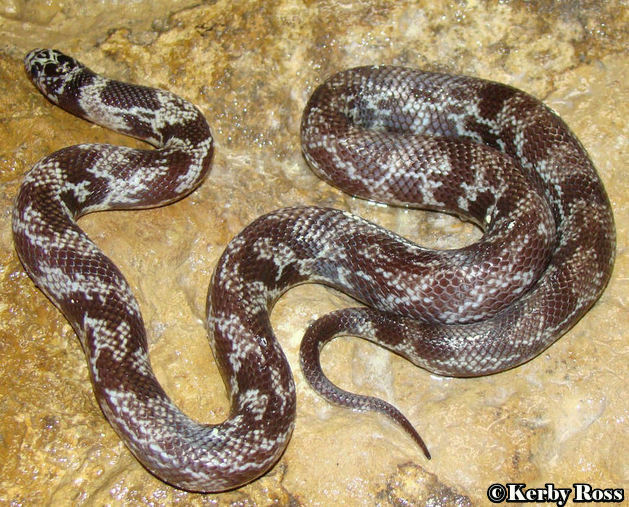 This morph is highly variable throughout its range. Its always found along side with normal banded kings. The percentage of stripers in a given locality can be as high as 80% and as low as about 5%. 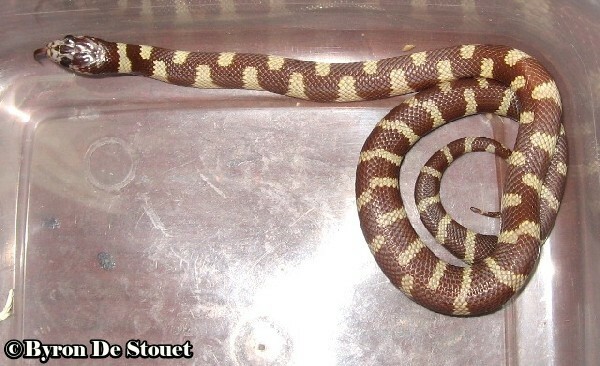 The SD striped morph has a stripe about one and a half scales wide that runs from the neck down to the tip of the tail. 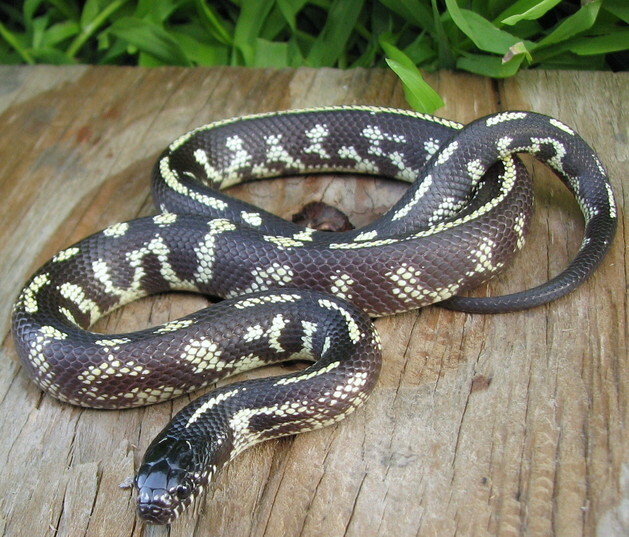 Most specimens are not perfectly striped and usually have a few breaks in the stripe, particularly at the tail. 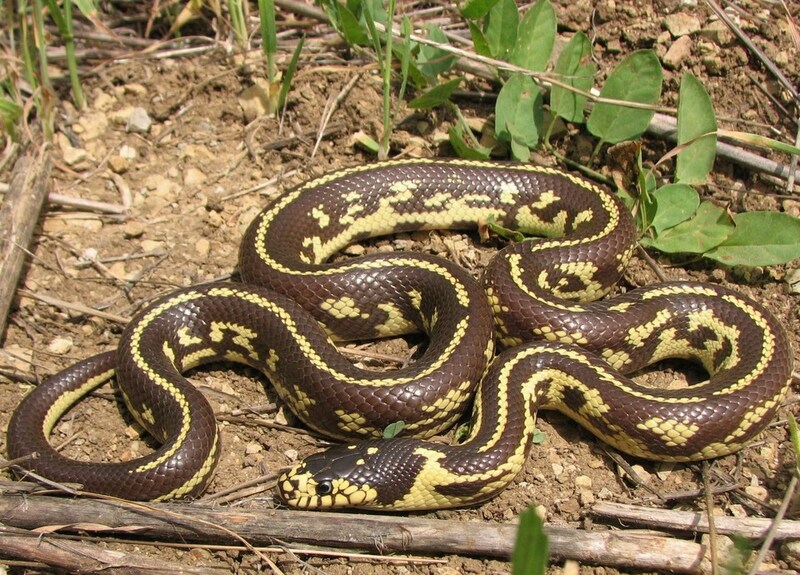 Side stripes can also be present on the upper sides. 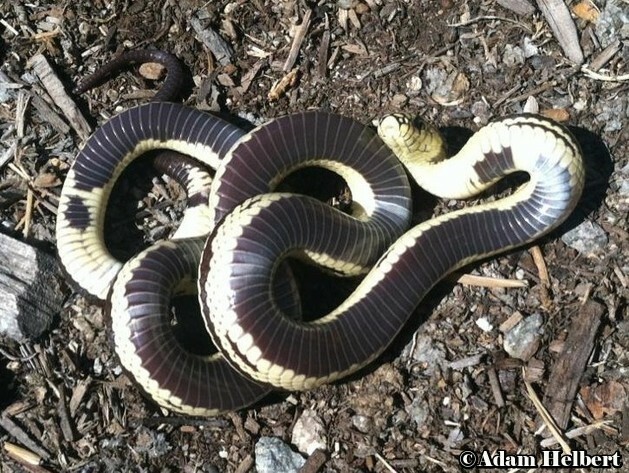 These are often called triple striped Cal kings or the triple striped morph. These side stripes can be well defined or reduced to speckles. The side pattern can be speckled from high up on the sides to very low or no speckling at all. 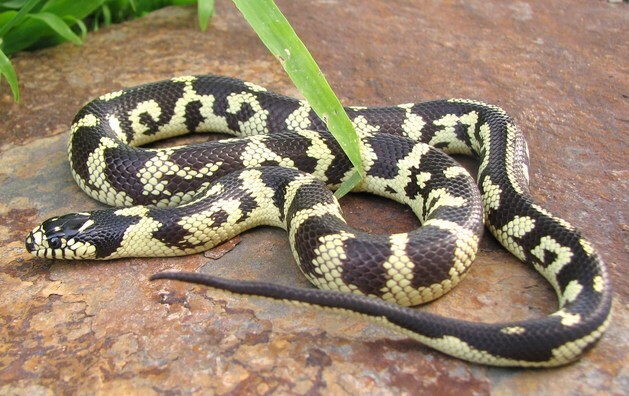 In some areas the speckling is replaced by light pigment with scattered dark markings throughout. This look is more common in Riverside Co. and Northern SD County. The belly is highly variable as well. It can be solid yellow or have dark markings within the yellow. It can also be solid brown to almost solid brown. This happens in about 1 out of 5 specimens in the wild. 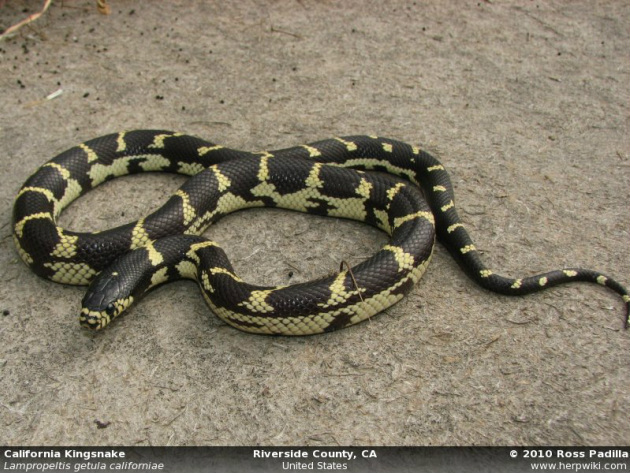 The belly also may be completely or partially checkered in Riverside County. In some areas the stripe can be replaced with a combination of dots, dashes, and cross bars, and even bars or dashes that are curved. Some may even have wavy stripes, wide stripes, thin stripes or stripes that zig zag. 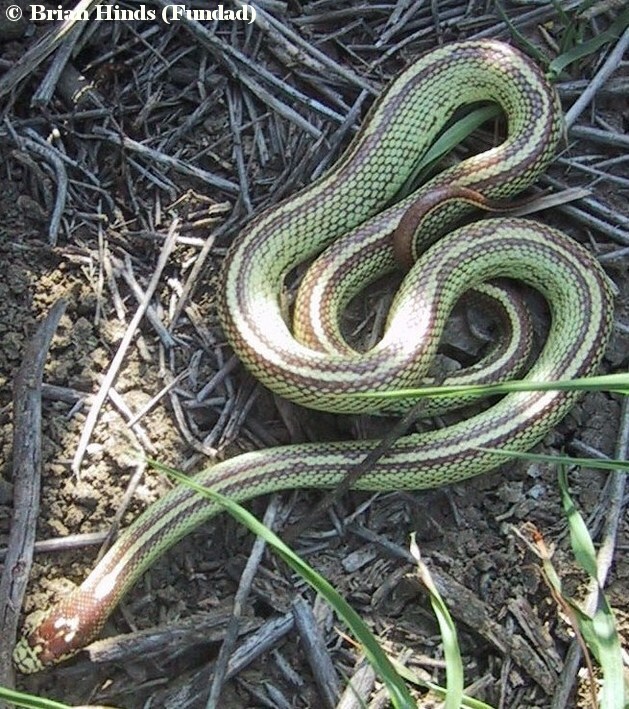 Sometimes banded individuals will be partially striped or aberrant or even have a nearly patternless belly pattern. 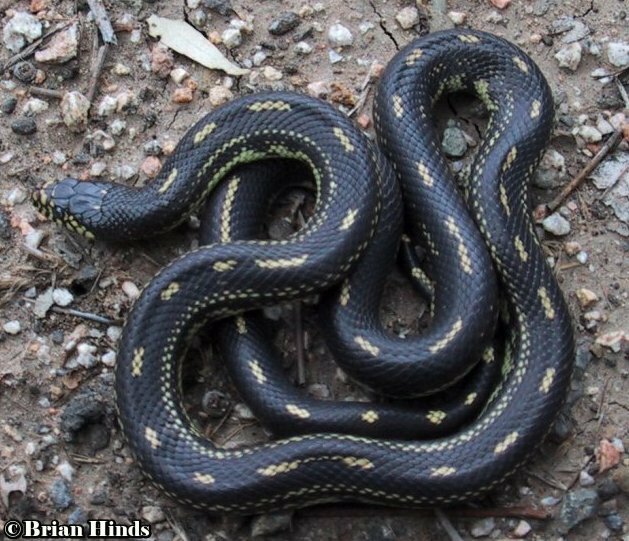 Some may also be half banded and half striped or half banded and half aberrant. 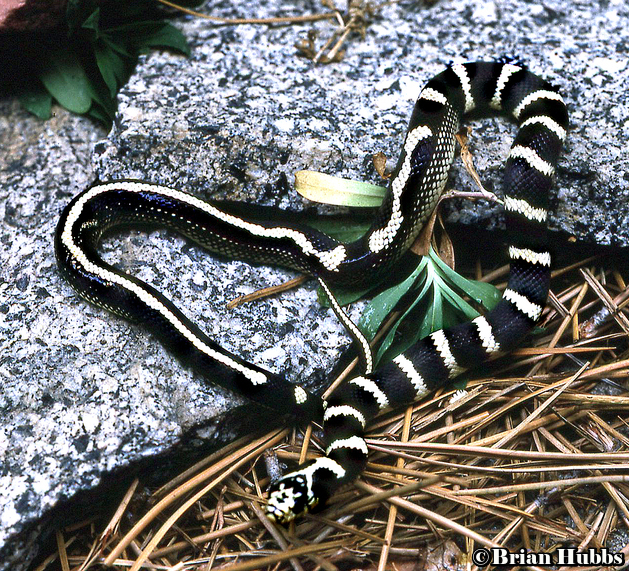 All these pattern types that are different than the typical striped form are called San Diego striped aberrants. 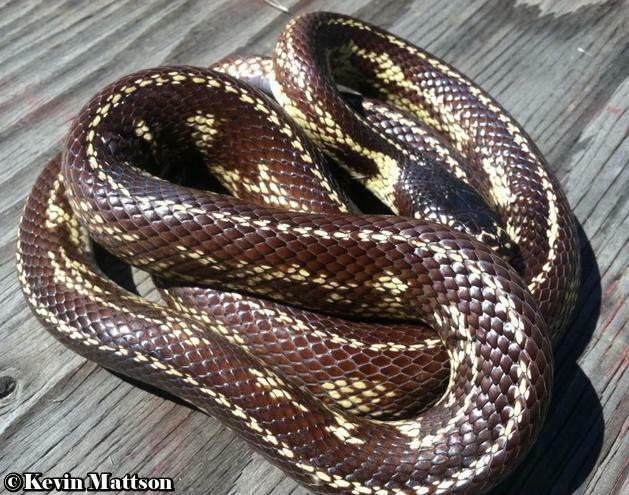 These aberrant patterns are caused by the mixture of banded influence in the SD striped morph. Its not exactly known why this happens. 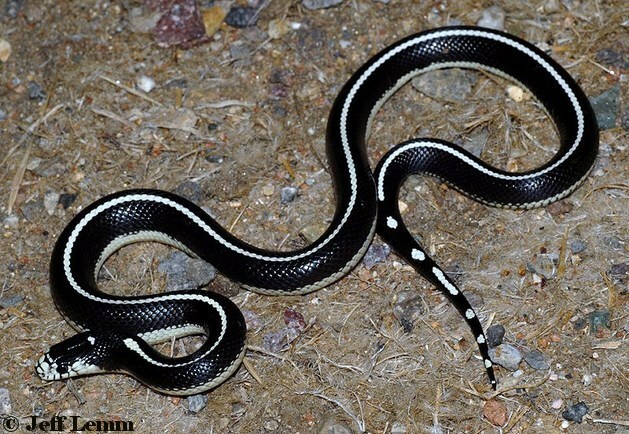 The aberrant forms usually occur in small numbers where the San Diego striped morph is present. 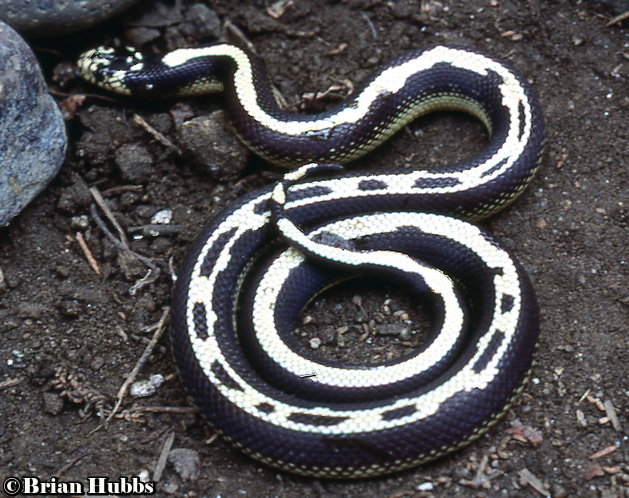 In some locales, aberrants can be more common than the typical striped morph. This is true for parts of Riverside County, Northern San Diego County and Southern Orange County. In fact 95% of the examples I’ve seen from Southern Orange County have been aberrants. 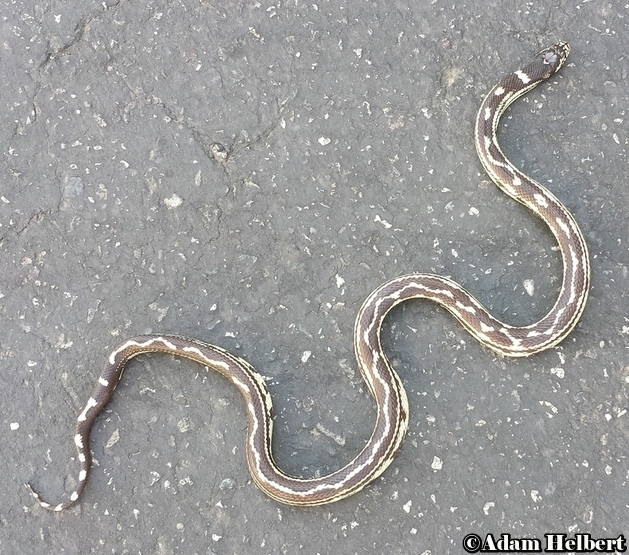 SD striped kings have been found as far north as Irivine in Orange County. That is well into the Newport morphs natural range. The SD striped is a lot less common than the Newport where their ranges overlap. 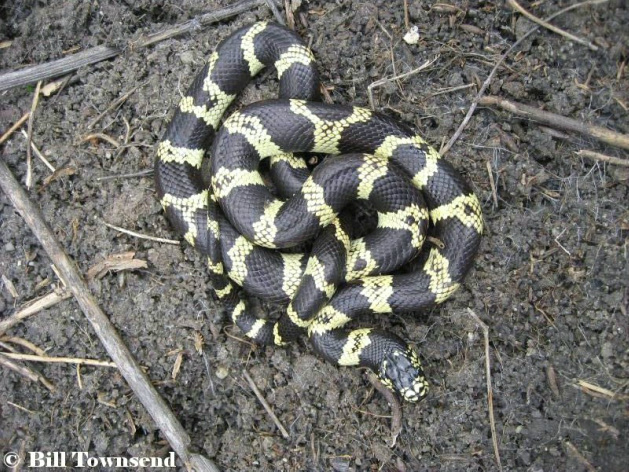 The lack of speckling that is replaced by solid yellow on the sides with dark aberrant patterning scattered throughout the yellow, may be due to Newport gene flow. 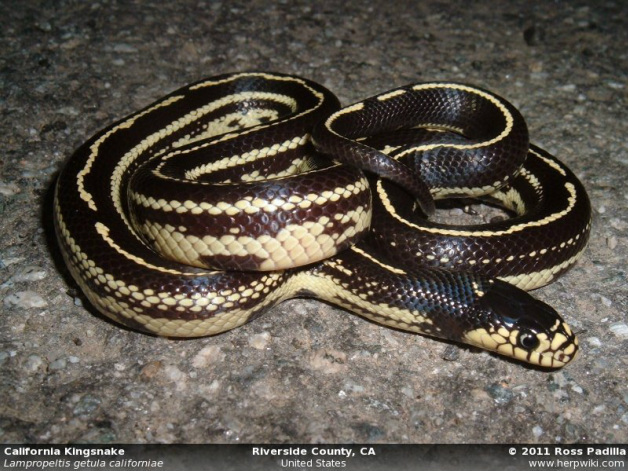 SD striped specimens like this are common in Western Riverside Co, Southern Orange Co. and Northern SD County. 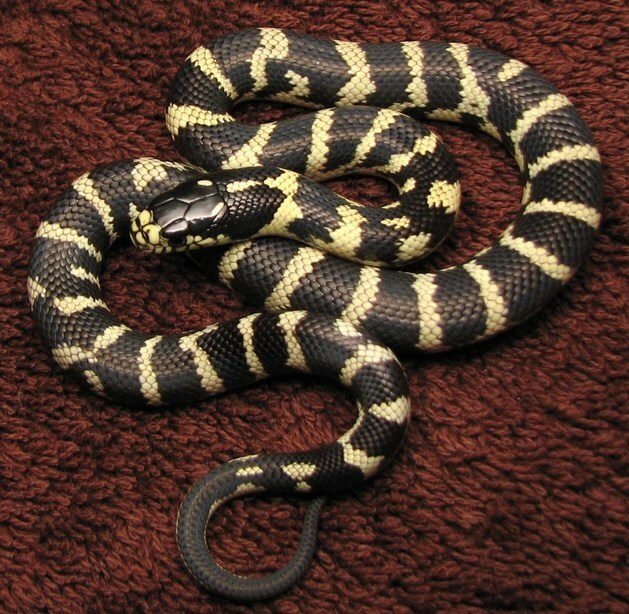 The genetics of this morph are similar to co-dominant, but not exactly. 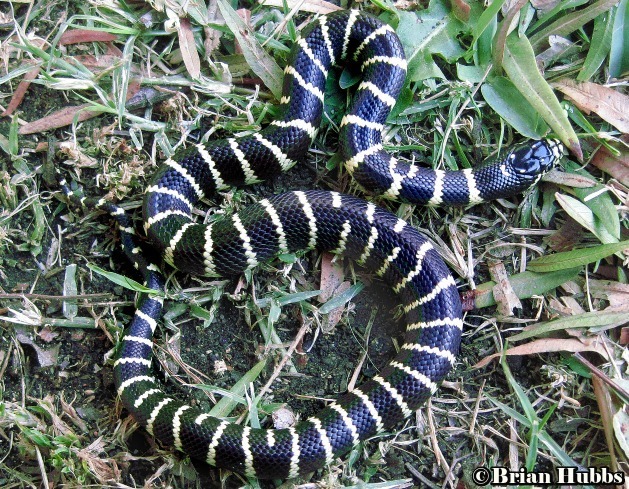 In the wild, striped to striped will produce striped, but often produces banded and striped. 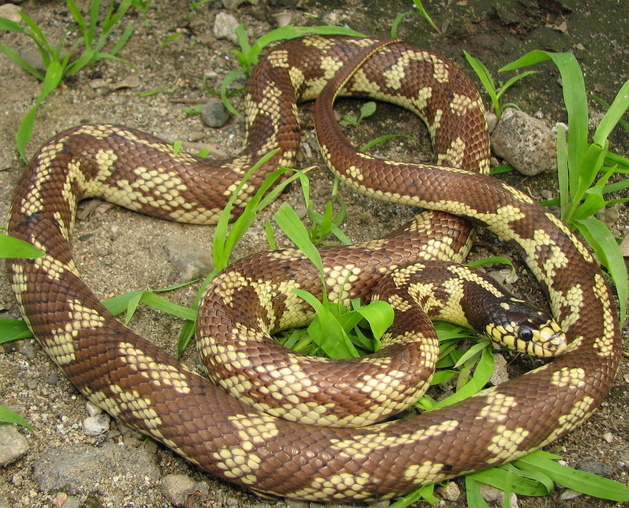 Striped to banded often results in more pattern types of what the mother was. 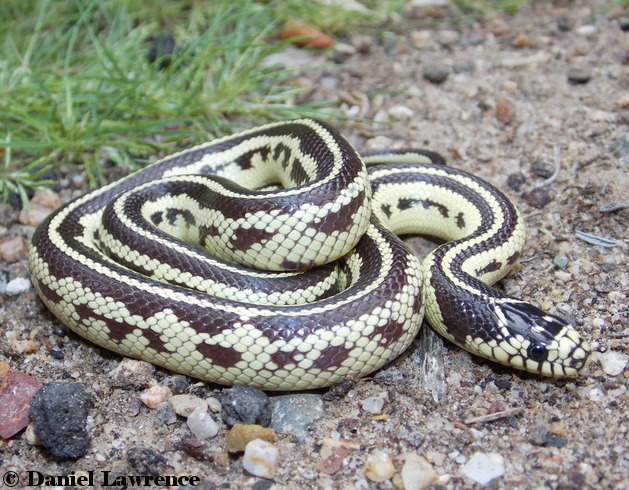 So a striped female to a banded male will often result in more striped than banded. In captivity, it can be quite different. 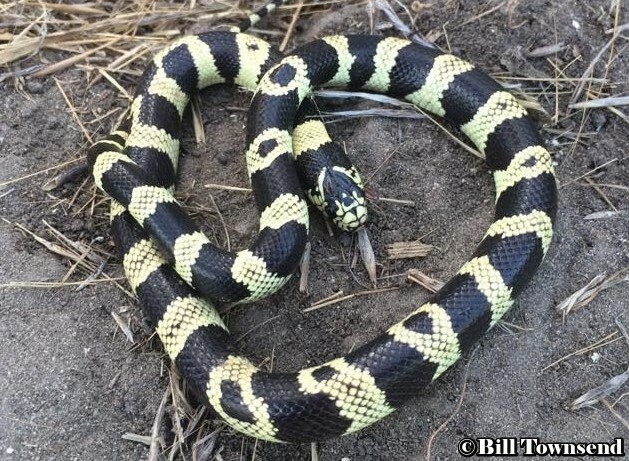 If you take a wild caught striped king and breed it to a banded found well outside the SD striped kingsnake range, you will often get lots of aberrants. 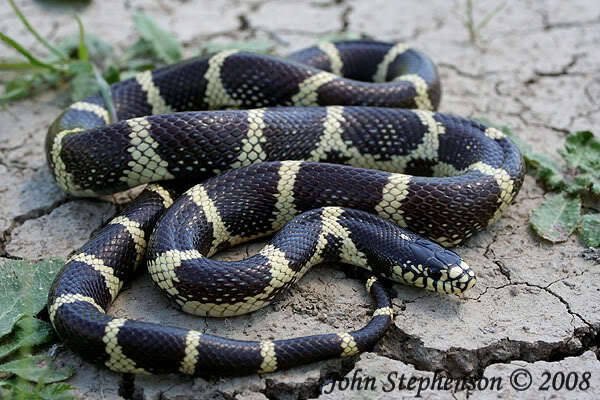 In the wild if you breed an aberrant to a banded or striped from the same area, rarely will you produce other aberrants. 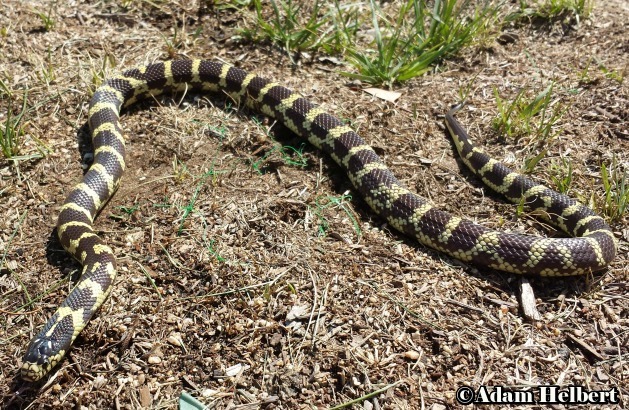 This is why aberrants are not common over much of the SD striped range. This may play out differently in areas where aberrants are very common. Aberrant patterns with a mix of dots, dashes, and bars are not always random. Certain types tend to be found in certain areas. 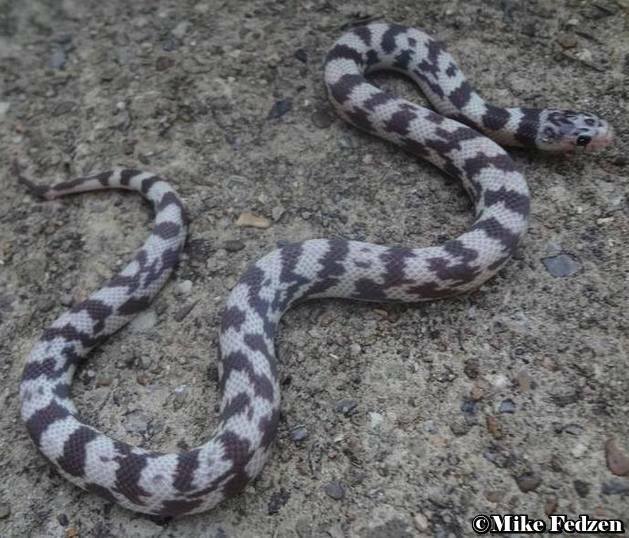 These are also referred to as morphs even though they’re still the SD striped aberrant morph. 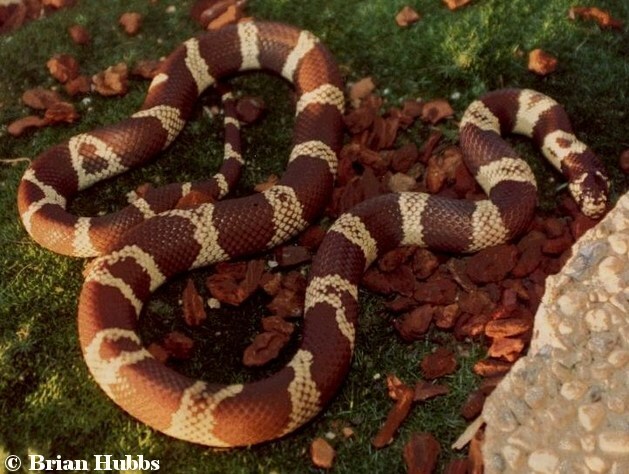 Some of their names have been in existence for a while and others were named by Brian Hubbs in his book on common kingsnakes. Here is a list of the more well known aberrant morphs. This morph can have a mixture of traits, but should be at least 75% dotted. 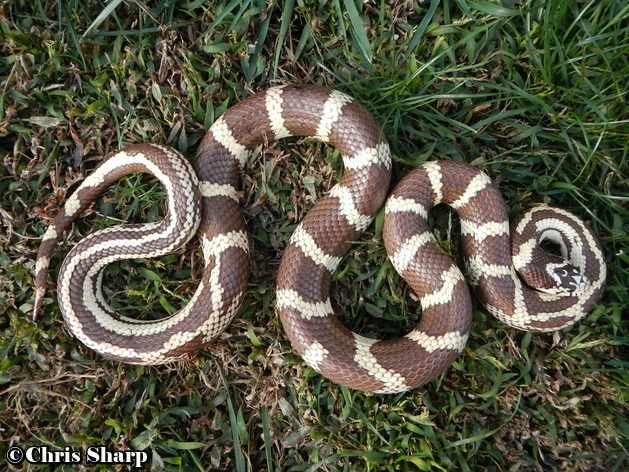 This morph has at least 75% dashes down its back often with partial striping. ​There are rarely side stripes. Normally the sides will be clean or spotted. ​labeled highway morphs unless they are locality animals. aberrant markings on the sides instead of speckling. ​breeding programs, but they can be found in the wild too on rare occasions. the stripe. Another rarity in the wild. ​rarely encountered in the wild. ​and repeats that pattern several times. The more times its repeated, the rarer it is. ​expected to reach the tail. ​none on the sides or very high up on the sides. ​probably the best way to describe it. 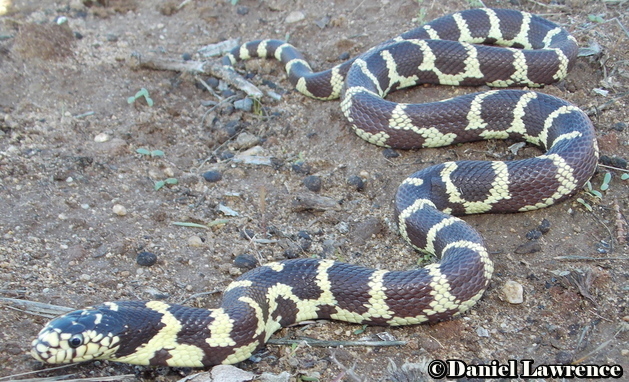 ​common in Western Riverside County. 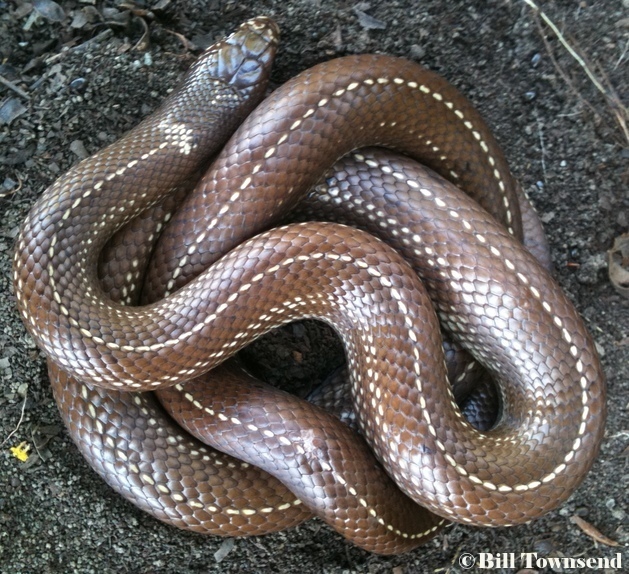 This is also known as the Newport-Long Beach morph (Hubbs 2009) This is another striped morph from Southern California commonly known as the Newport morph. Newports are found from the coastal areas of Los Angeles and Orange Counties. 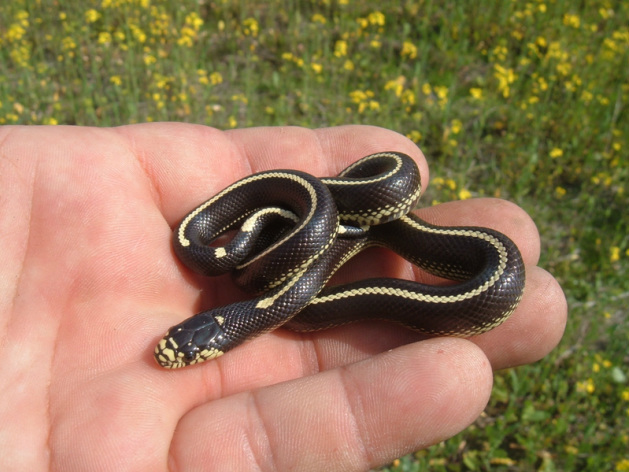 They are not nearly as common within their range as the San Diego striped morph. 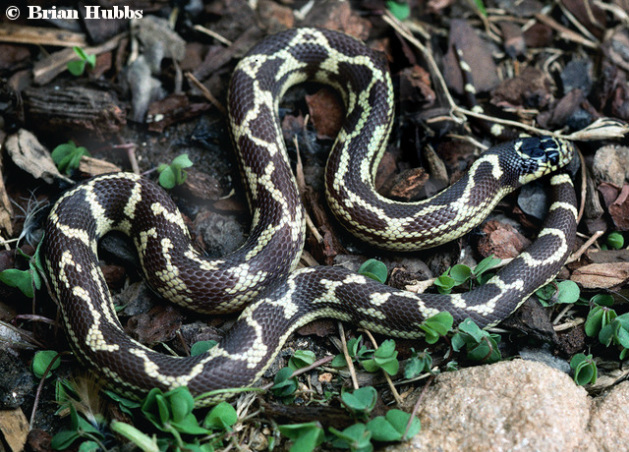 Extreme habitat loss due to development has also contributed to the rarity of this morph. Like all natural occurring morphs, the Newport is found along side with normal banded kings and make up about 10% of the overall population on average. They may be more or less common in certain areas. Their distribution might be spotty within their range as they seem to be absent from certain locales that should have them. The Newport was given its name by collectors in the 1970's for the odd striped kings they found in the Newport Beach area of Orange County. The typical Newport pattern consists of a stripe that runs lengthwise from the neck and ends right at the beginning of the tail. The tail is almost always patternless on top, but on occasion, broken and sometimes complete rings form on the tail. The stripe may be complete or broken in several areas. 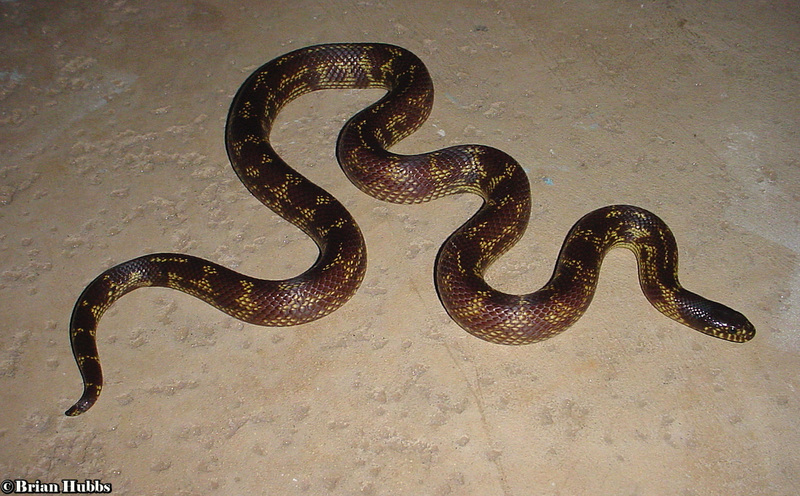 The ventral pattern often resembles a reduced checkered pattern. It can also be very aberrant with blotches randomly connected. It can also be solid yellow or solid brown or any combination of all these traits. The side pattern is highly variable with dark and light blotches randomly arranged. 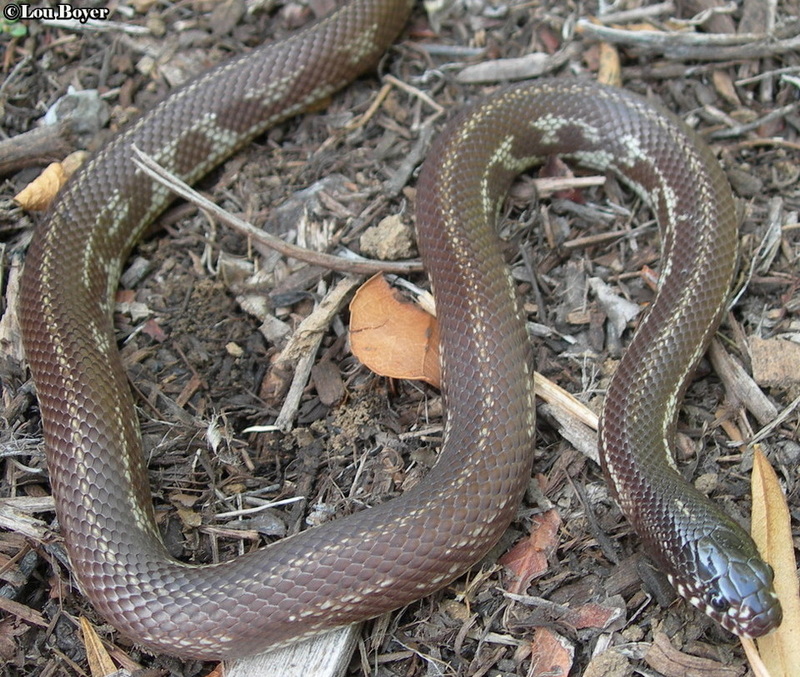 Some specimens may show traces of a stripe high up on both sides. I’ve never seen complete upper side stripes like in the SD striped morph. 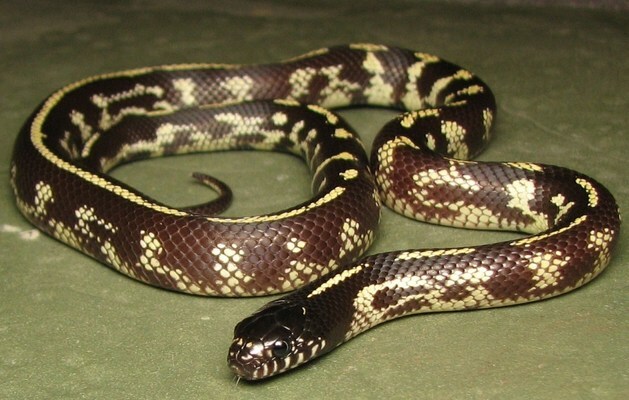 The speckling found in the SD striped morph is generally absent in the Newport morph, but there are often traces of it. 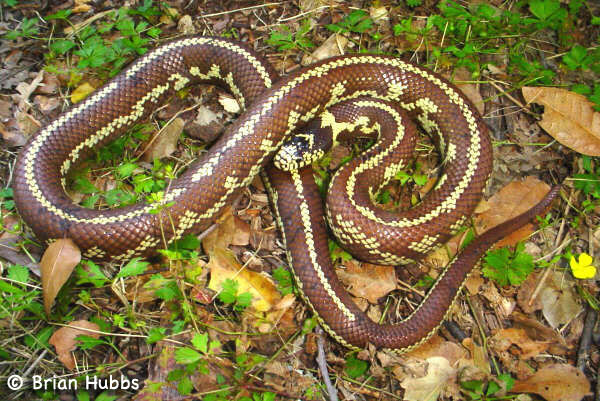 Through limited breeding trials the Newport morph appears to act like a co-dominant trait in its form of inheritance from locality breeding. I’ve seen less than half to half of the clutch resulting in Newports from Newport to banded breeding. Newport to Newport mostly results in all Newport offspring, but can produce a small amount of bandeds just like the San Diego striped kings. It appears this gene reacts very similar to the SD striped gene. 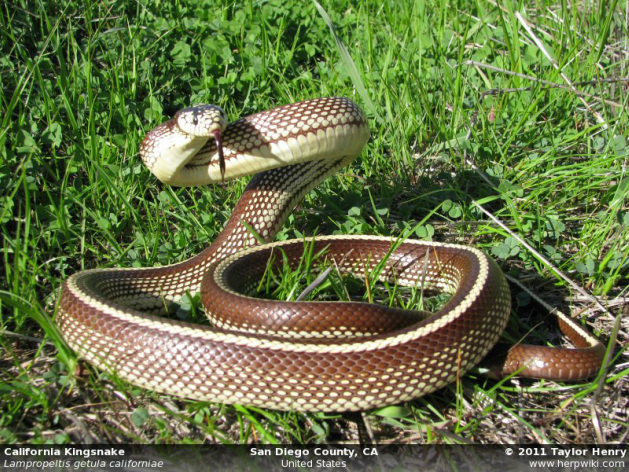 Like the SD striped morph, there are several different Newport aberrant forms that have their own distinct look. All Newports that do not fall into any particular category are simply called Newport aberrants. 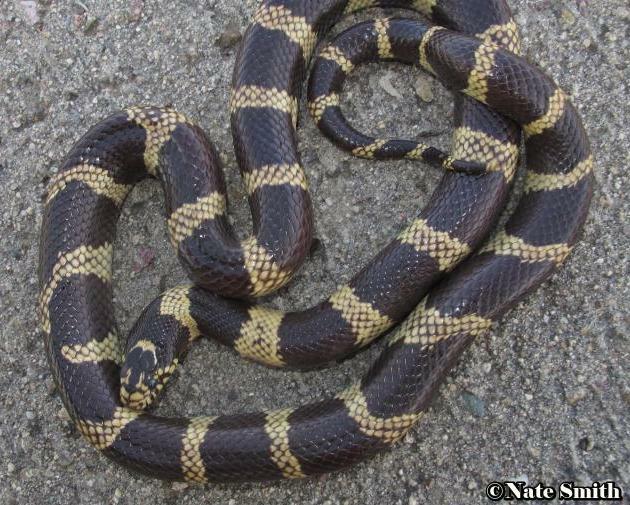 My first experience with one of these came in the Spring of 2006, when Don Huffman and I were searching an area of Los Angeles County known for several different California kingsnake morphs. 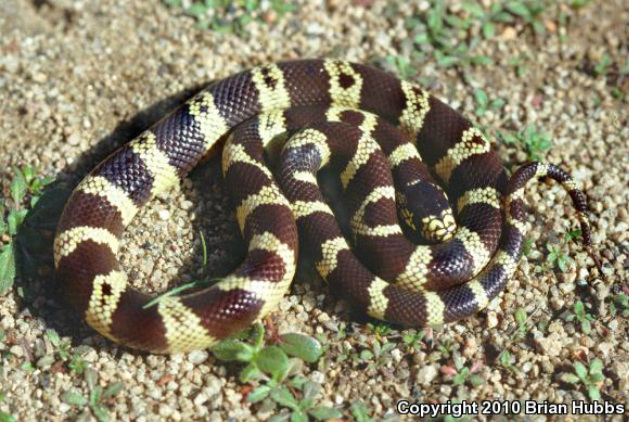 This area is the holy grail of kingsnake habitat in Los Angeles. We had found several banded kings that day under boards. We were both flipping boards and and became separated. I decided to wait for Don to lift a nice looking board I happened on. Don walked over, I lifted the board, and laying there was the first Newport I’ve seen in the wild. I had really been wanting to find one, so this was a very special moment for me. 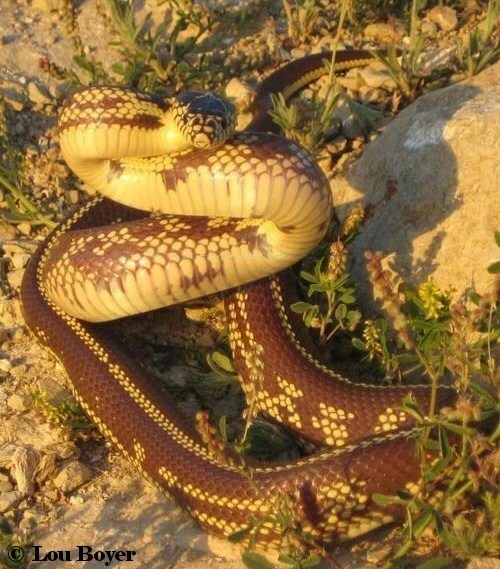 I took many photographs of this snake. Because I was still new to aberrants, I didn’t notice this Newport was quite different from the typical Newports I had seen photos of. As time went by, I came to realize this was a very different looking individual we found that day. It had a mostly typical pattern on the sides, but the stripe was replaced with wide diamond shapes, small dashes of wider than normal striping, some normal striping and a little scrambled banding. I haven’t seen another Newport aberrant quite like this one, but most Newport aberrants are quite different from one another. Some individuals have a great deal of dots or dashes and they could be called dotted or dashed Newports, but I haven’t seen enough individuals to feel there’s a need to add these names to the list. Newport aberrants are found throughout the Newport range, but seem a little more common in coastal Los Angeles county. No matter where they are more common, they are still not found as frequently as typical Newports. They might make up 10% or less of all Newports found. with markings on the tail, but their pattern is interrupted by Newport influence. 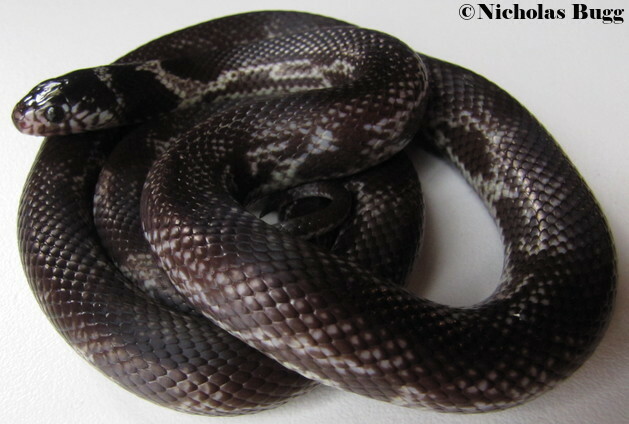 This morph has a very high percentage of dark saddle shapes that do not reach the belly. These saddles also have very uneven edges, giving them the name scrambled banded. Good examples have very little to no striping. 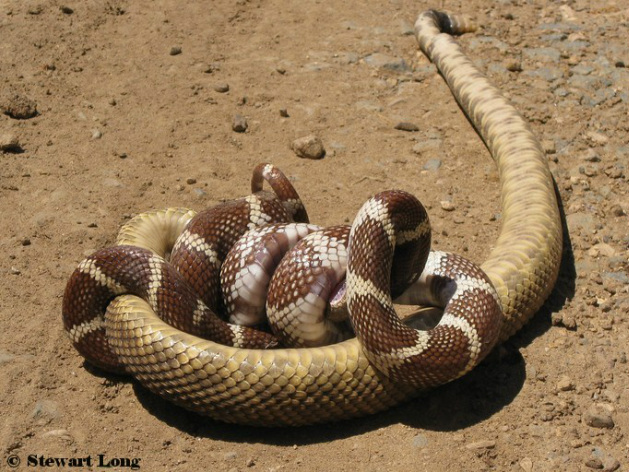 Most individuals that are partially scrambled banded will show it in the first half of the snake. The least striping an individual has, the rarer it is. The belly pattern can be that of any Newport. 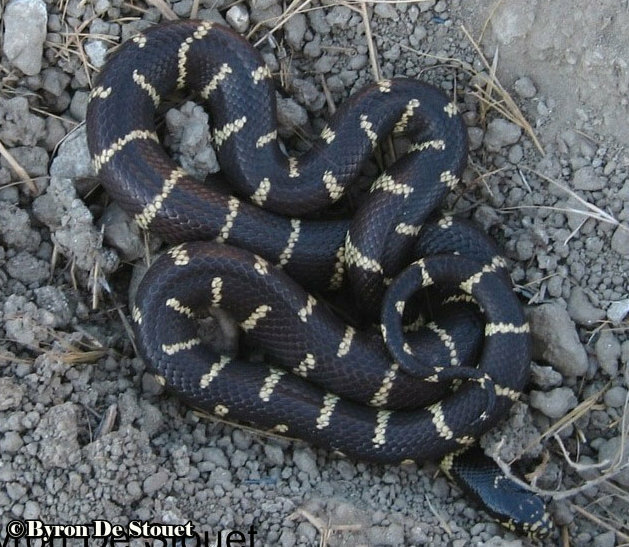 Although there is the possibility of this form showing up anywhere within the Newport range, they are almost always found in Western Los Angeles County. This Newport aberrant type in its purest form, is considered very rare in the wild. 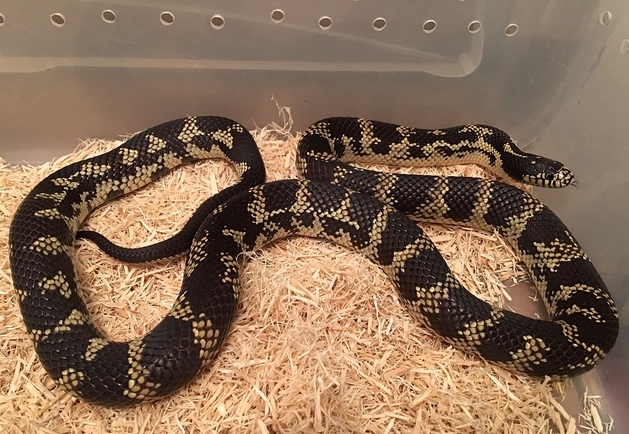 When breeding a scrambled banded Newport to other kings from the same locality, results will vary. 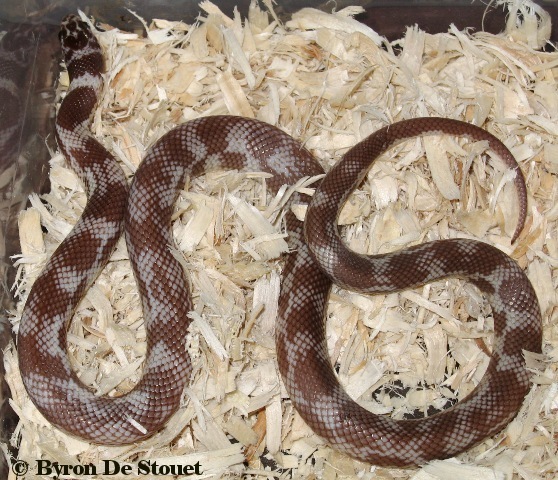 One year a scrambled banded bred to a normal banded might produce all typical Newports and bandeds. The next year it might produce all scrambled banded and bandeds. 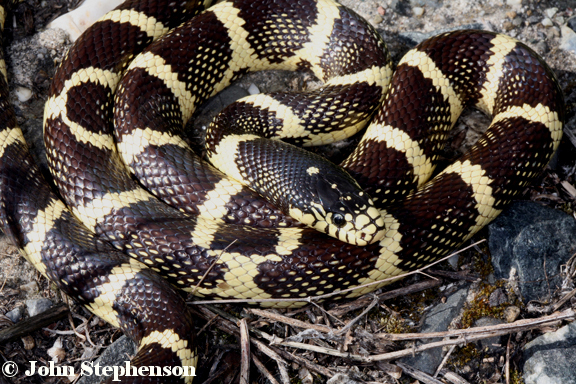 Even typical Newports found in areas with this morph can produce scrambled banded in locality breeding. This one has very strait bands. Only one individual I know of has been found in the wild. 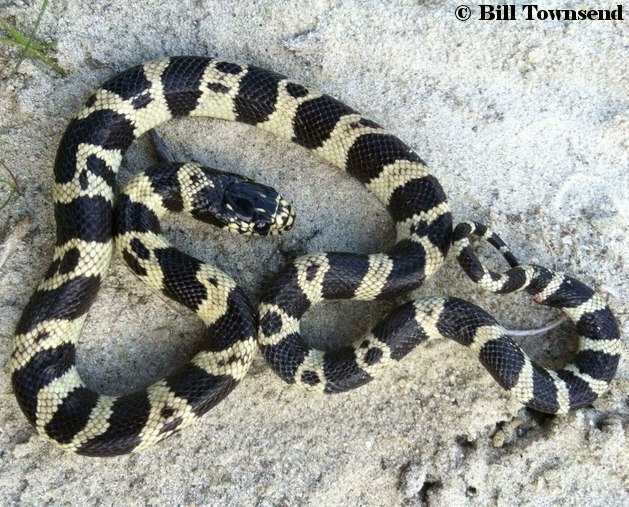 Back in 2009, Lou Boyer found an individual while hiking Orange County in late June. He named it the Chance chocolate back, after his son Chance. I’ve shortened it chocolate back for simplicity. It basically has a Newport pattern but without the stripe. 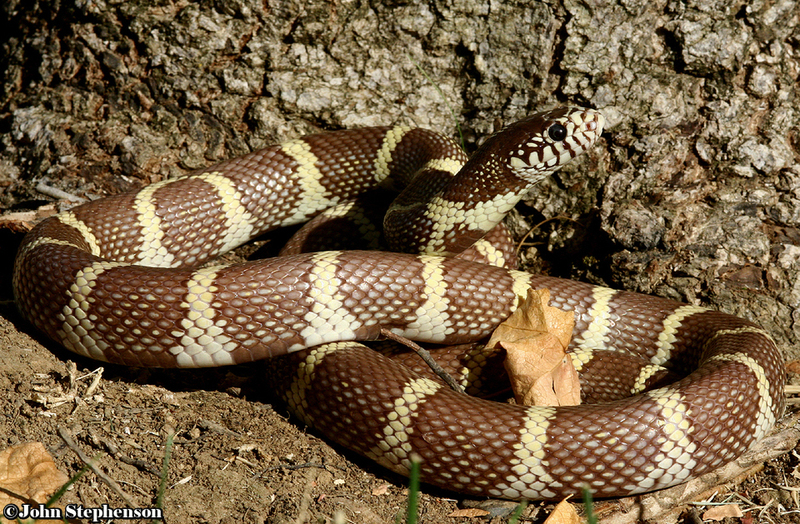 The stripe is reduced to being just barely noticeable in the form of light speckling in a few areas. This could be considered borderline reverse wide striped with vanishing striped. Those names were around first, but the reason why I went with the name Lou gave it is, because it was found in the wild. 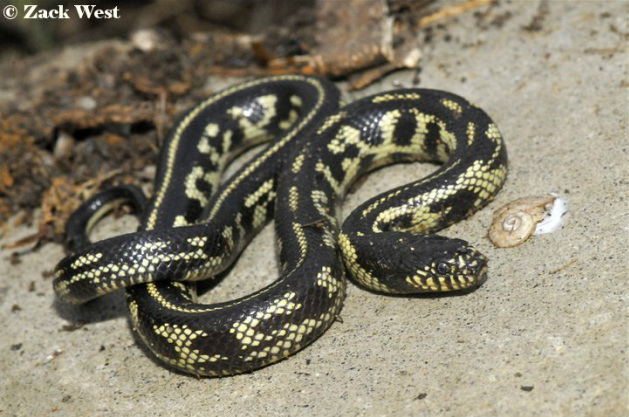 Wild specimens won’t typically show a mixture of the SD striped gene and Newport gene, like they so often do in captivity, unless they are found in Southern Orange County. 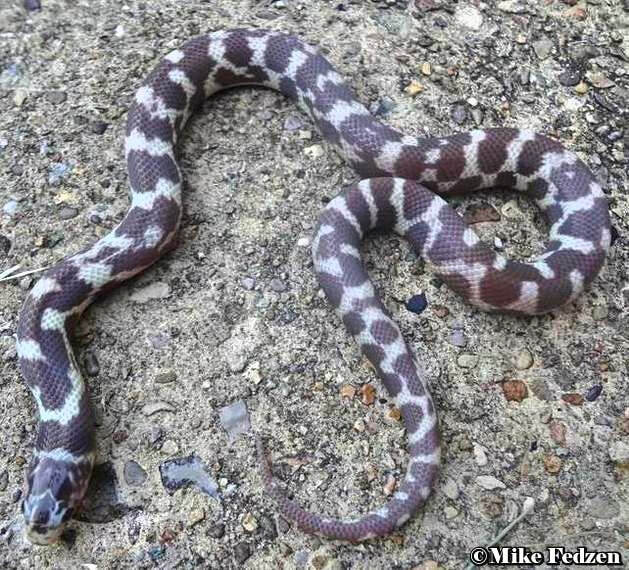 This Newport aberrant morph is also very rare. 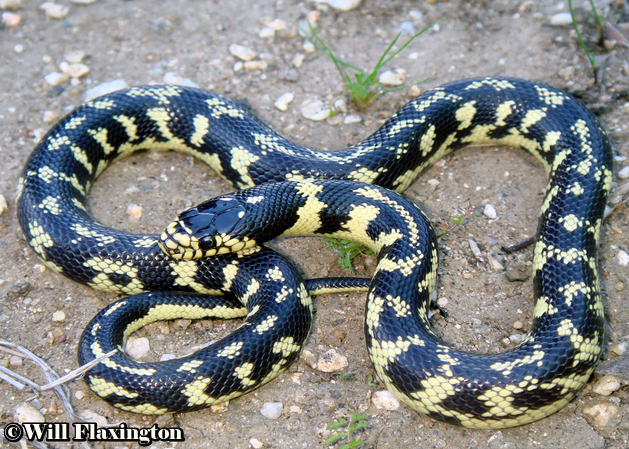 The Newport Mud morph is a kingsnake expressing Long Beach hypermelanism and Newport at the same time. They can only be found where those two morphs are found in the same population. 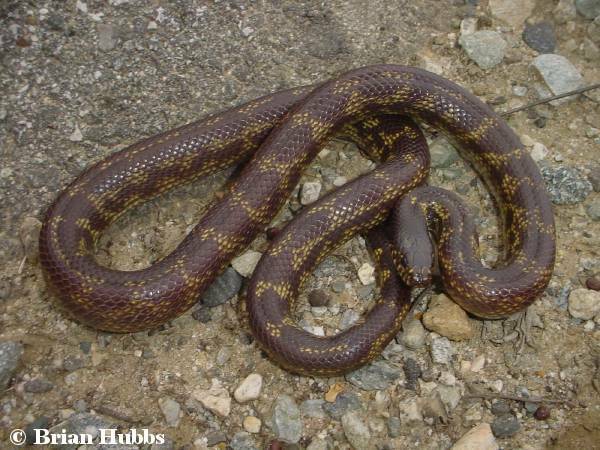 Brian Hubbs named this “double” morph after a very “dark” individual he found in the spring of 2006. The individual was so dark or expressing a great amount of LB hypermelanism, we thought it was a new morph or even a part of the Whittier group. After some time, it became apparent what the Mud morph truly was. Brian Hubbs’ mud morph is the exception. Most individuals are not nearly that dark. 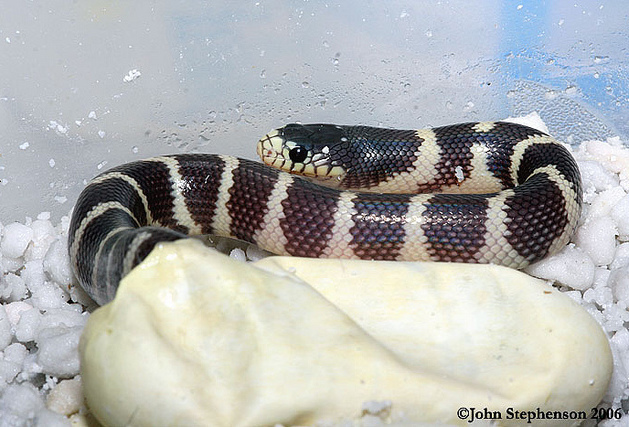 Only one other individual I’ve seen, hatched from a wild caught gravid female by Lou Boyer, may be as dark. The light pigment on juveniles appears wax like, or skim milk compared to vitamin D milk. It appears slightly watered down and not as dense. 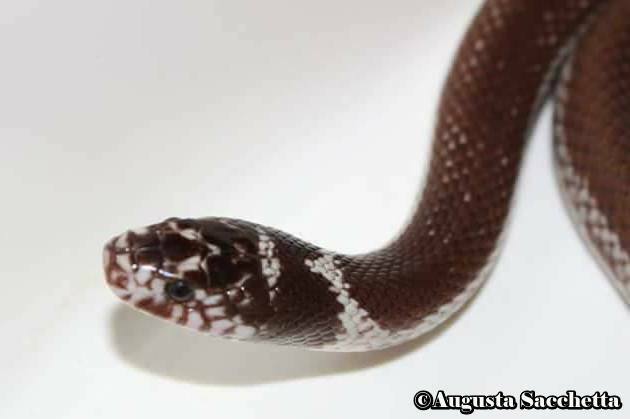 This look is lost after several months when the normal coloration starts to develop.